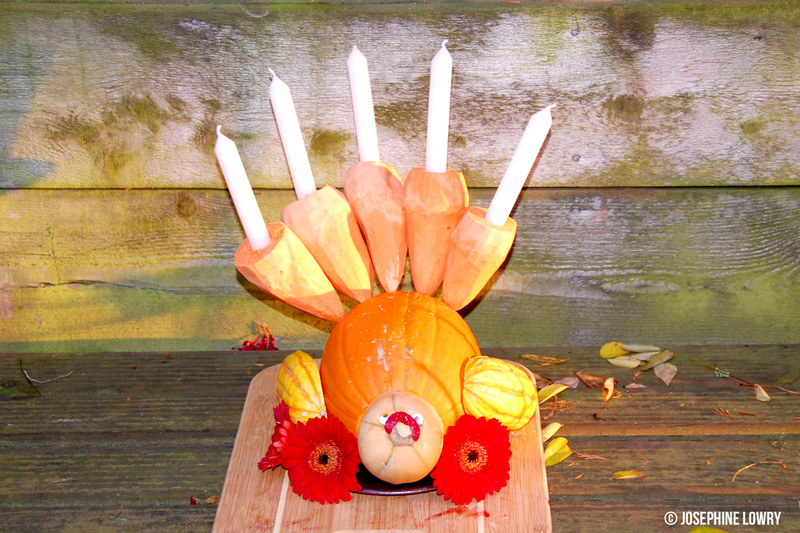 Turkey Candelabra Centerpiece = Turkelabra! 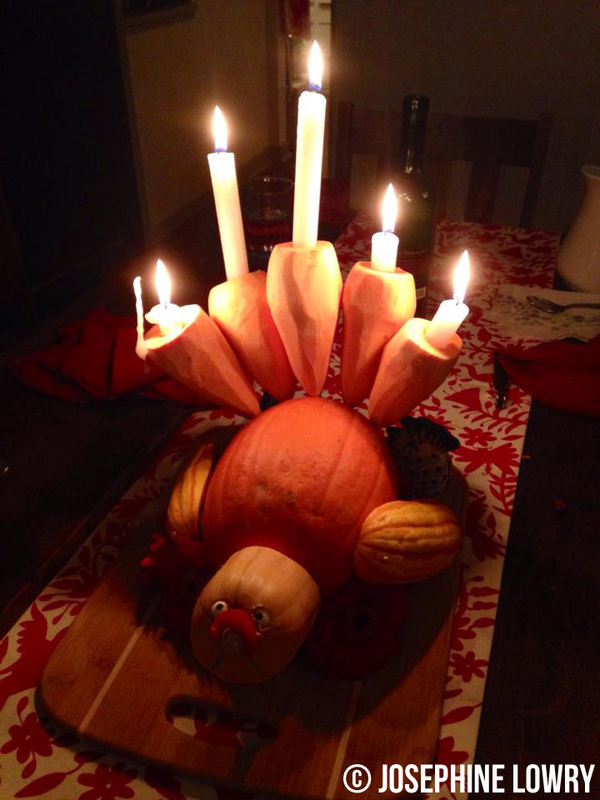 Turkey + Candelabra Centerpiece = Turkelabra! Having temporarily satiated my macabre tendencies, I shifted medium from meat to vegetables for this year’s Thanksgiving centerpiece. 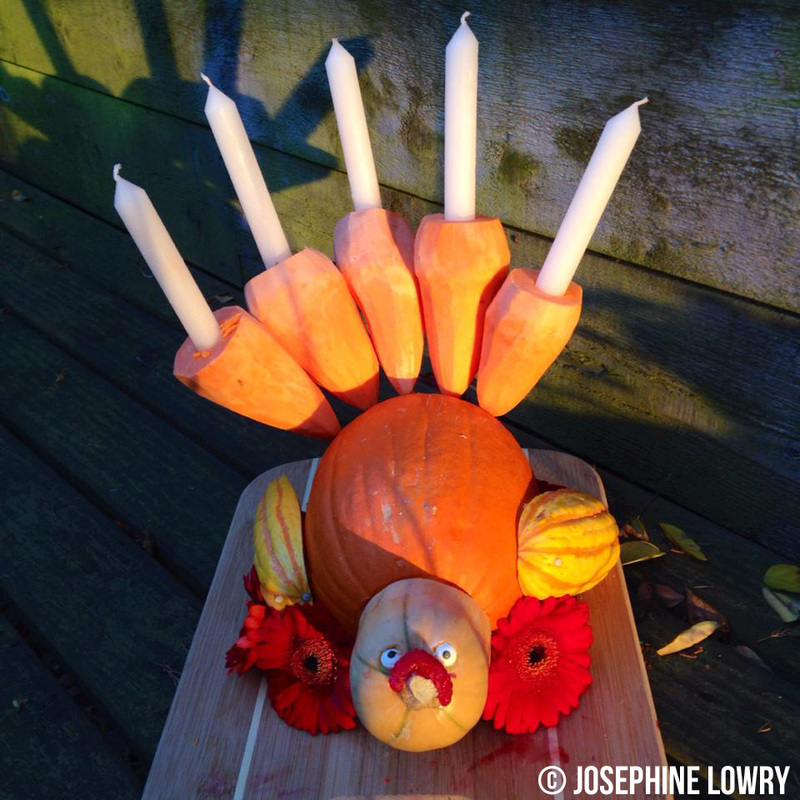 Inspired by the delightfully amusing Menurkey, a menorah + turkey combination that celebrates the Hanukkah & Thanksgiving overlap, I wanted to also combine candles with turkey. But since I’m not Jewish, I opted for a candelabra. Thanks to a weekly delivery of CSA, I was spared a trip to hell (aka: the grocery store on the eve of a food-based holiday) as I already had a pumpkin, a delicata squash, and some yams. The turkey nose/face is the tip of a butternut squash with candy eyeballs, and a waddle made from a ripped-open raspberry. The body is a pumpkin and each wing is a halved Delicata squash. The tail feathers are yams which I was able to peel without taking a single chunk of my fingers/hand off in the process. While already pretty pointy, I emphasized the point as much as my peeler allowed. To assemble the various parts, I used bamboo skewers. It took a few tries to get the sticks rammed into the various vegetables and the angles to work, but I didn’t maim myself or cut any fingers off when I clipped the skewers. So success! Overall, I was really pleased with the playfulness of the centerpiece. The only thing I’d do differently would be to drill the hole for the candles at a better angle. While entertaining, the falling lit candles could have been a real mess if they’d set the table runner on fire. Turkelabra in a natural state!